I recently bough an Arduino Uno with a 1.8″ TFT Arduino Shield and I thought I would have some fun with it by using it as a Spotify controller. Interact with Spotify and be able to get the artist and song as well as perform actions such as next track, previous track, play/pause, increase volume and decrease volume. Use the serial port through USB to send data between Arduino and Mac. Display song, artist and use joystick input for controls. The Mac version of Spotify supports Applescript so we can use that to perform the actions we need. However, I wanted to keep all the app code in the same language (Ruby) and in the same script so I found a gem (rb-applescript) that executes Applescript with Ruby. # Include Input stream ready? 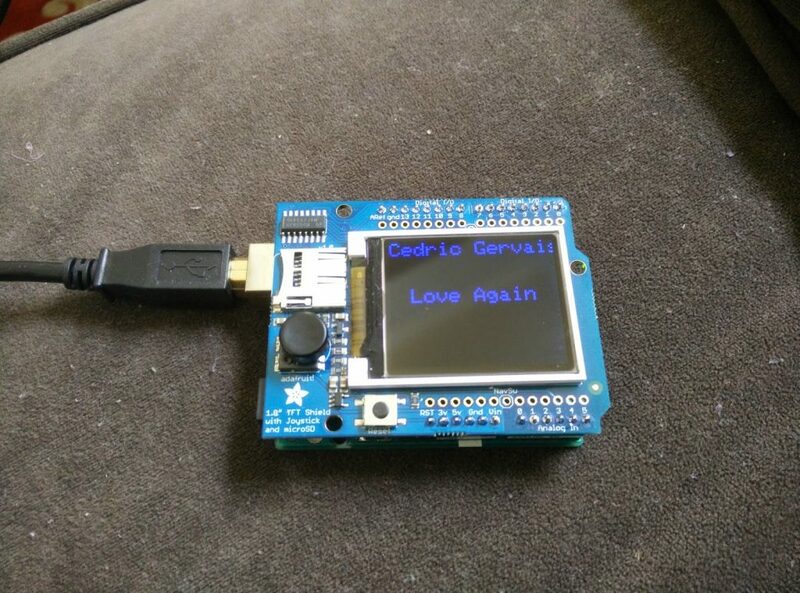 The 1.8″ TFT Shield I bought from Adafruit came with a graphics library for drawing shapes and text. We can use it to draw the current song and track to the screen. Since the screen is not wide enough to display a full song name, we will animate the song text by scrolling to the left. We will do this by redrawing the song name X units to the left every 0.5 seconds where X is determined by the desired scroll speed. When we redraw, we draw the song text of the previous position in the background color and then we draw the song text again in the text color shifted X units left. We do this because we want to minimize the number of pixel draws since redrawing the screen causes a flicker. When the end of the song name reaches the screen, we need to reset it back to the original position. The width of each character in text size 2 is 12 pixels and the screen width is 128 pixels so if x < -12 *song.length() + 128, we reset x. The joystick can be read by reading analog 3. In our ruby app, we can perform actions based on the joystick state.